Dr. David Crone is director of choral studies at Monroe-Woodbury High School. Currently choir director at Christ Church, Warwick NY, he was music director/conductor of the Pro Arte Chorale in NJ from 1997-2010 and has served as conductor for NYSMF, the Community Choral Society, the Riverdale Choral Society, and the Boys Choir of Harlem. In 2009 he made his European conducting debut as part of the Liverpool Capital of Culture Festival, followed by a performance at Liverpool’s Anglican Cathedral. He holds a doctorate from Seton Hall University, a master’s in conducting from Temple University and a Bachelor of Arts in jazz composition from Berklee College of Music. Crone’s passion for performing extends into the jazz community with regular appearances as a jazz pianist. Crone is often a guest conductor, accompanist and clinician at choral festivals and conferences throughout the tri-state area. Steven Wing has appeared as guest conductor and accompanist at All-County and Area All-State choral festivals throughout New York State. Steven has been assistant music director and accompanist for Jubilate since its inception. 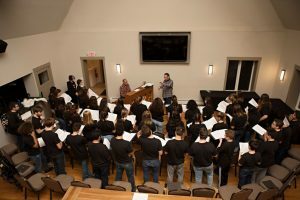 He recently retired after a long career as a distinguished member of the Monroe-Woodbury Middle School music faculty, where his Chamber Chorus consistently earned the “Gold with Distinction” rating at the NYSSMA Major Festival. Wing holds a Masters of Music in Composition/Music Theory from the Fredonia School of Music at SUNY Fredonia and a Bachelors of Music in Music Education from the Crane School of Music at SUNY Potsdam. Steven has performed at Carnegie Hall, and has sung in Europe while touring with choirs. Most recently, he was baritone soloist with the New York Wind Symphony. Maureen Burt attended the State University of New York at Albany where she earned a Bachelor of Arts in English, with minors in Performing Arts and Education, in 1995. She then remained at the University at Albany and received her Masters of Science in Special Education (1996). Maureen has been a Special Education Teacher at Monroe-Woodbury Middle School for the past 21 years, where she has directed the Middle School Musical for the same length of time and continues to do so. She started a Summer Enrichment Theater Program for Middle School and early High School students shortly after she started teaching at Monroe, and continued running that program for fifteen years. In addition to her work at Monroe-Woodbury, from 2008-2010 she and Steven Wing directed the SOUZA Scholarship Community Theatre Productions at Palaia Vineyards. Outside of her professional responsibilities, Maureen is also an active member of the Christ Church choir.